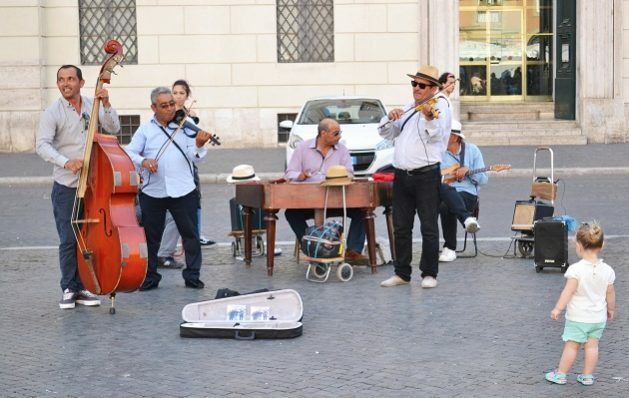 ROME, Jun 1 2018 (IPS) - During the past recent years, the city of Rome has experienced a rise in the presence of musicians in its streets and in particular those playing traditional sounds. 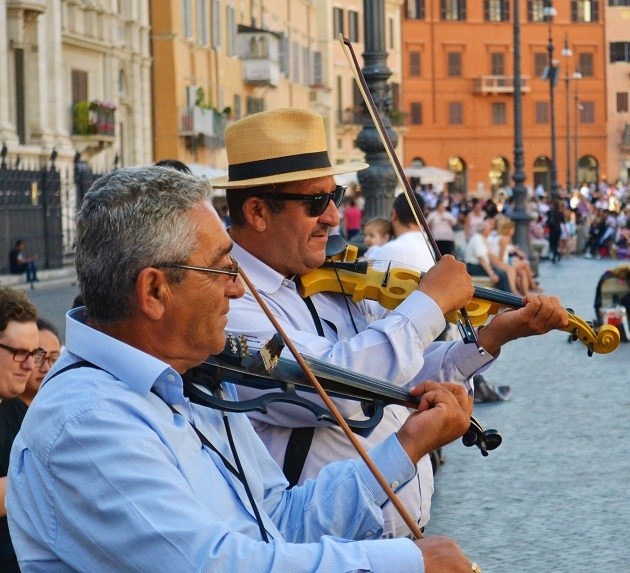 It does not take a long time, while walking in the streets of Rome, to see a band playing joyful traditional sounds in Piazza Navona. The group renamed itself “Colosseo Band” but they are all from Eastern Europe. A double bass, violins, guitars and a xylophone: this unique assortment gives rise to an explosion of pleasant sounds that make people dancing in the same square. “People used to think that traditional and working-class music had no place in urban context and that it was more related to rural areas,” said once Alessandro Portelli, a historian who, together with the musicologist Sara Modigliani created the project “Roma Forestiera” (“Foreigner Rome”). ” A few years ago, Romans started to walk around the city and seeing musicians at almost every corner and they realized that those musicians were not Italians but Nigerians, Romanians and Senegalese: people realized that music had come back to the streets of Rome and those who brought it were foreigners”. The project “Roma Forestiera” (“Foreigner Rome”) was created in 2010 by the cultural association ‘Circolo Gianni Bosio’ and it is only one of the many other initiatives that want to bring together migrants and Italians through music. The aim of the association is to study and spread the music performed by migrants in Rome and the rest of Italy. The founders of the project –Portelli and Modigliani – went on a tour to the streets, the mosques and the schools of Rome, and they were amazed by the variegated sounds coming from Bangladesh, Senegal, Ecuador, Kurdistan. Today they boast the biggest auditory archive of migrants’ music in Europe. Thanks to this initiative, the association could also promote the creation of the multi-ethnic chorus “Romolo Balzani”. The latter, promoted by the ‘Iqbal Masih’ school of Rome, gathers adults and minors singers once a week, in the neighbourhood of Torpignattara, one of the most multicultural hubs of Rome. The chorus, founded by Sara Modigliani, today is directed by two migrants women: Roxana Ene from Romania and Sushmita Sultana from Bangladesh. Only a few kilometres from there, in the heart of the Esquilino neighbourhood – another crucial melting pot of the city of Rome, known for its high rate of migrants – the association Apollo 11 created in 2002 the “Orchestra di Piazza Vittorio” (OPV, “The Orchestra of Piazza Vittorio”). In a neighbourhood where Italians are definitely a minority group, two Italians – Mario Tronco and Agostino Ferrente – imagined and created this Orchestra. The OPV gathers musicians coming from ten different countries and speaking nine different languages. Together, they transformed their cultural roots in one unique language: music. The OPV became in the past recent years one of the best examples of positive integration of migrants in the city of Rome. Through a self-managed system of auto-taxation carried out by some citizens, the OPV was able to create jobs and related residency permits for talented musicians from all around the world. “Music is a world within itself, it is a language we all understand,” said the singer Stevie Wonder once. Amongst the many forms of art, music has always been characterised by contaminations and borrowings between different peoples: it always represented one of the main vehicles for integration among different cultures. Without a doubt, the language of music is universal. Everyone can understand it regardless of the city, country or culture of origin. However, at the same time, music is also a banner of each country’s identity. Therefore, it should not be a surprise finding Greek people being so proud of their traditional music or Egyptians loving so much to listen to their cheerful melodies in their microbuses and taxis. This is the real value of music, which contains at the same time individualism and collectivism. It has its unique shape and identity and its own role in our societies. Music represents an individual experience diverse from person to person. On the other hand, music is also a collective experience because ears of people from throughout the world can enjoy it indifferently: melodies are able to unite people in concerts and celebrations or at the angle of a street while listening to a street musician. Therefore, music can be a tool for individual meditation or a tool to bring people together: different facets of the same coin.